I’d heard it before: I had to be a strong link in the generational chain. If I wasn’t, the spiritual wellbeing of the children that come after me would be greatly affected, into unknown numbers of generations…. The need was reinforced to me at that Act Like Men conference I recently attended. In the presence of some 6000-7000 men who converged on Copps Coliseum in Hamilton Friday evening October 4 and all day Saturday, James MacDonald, Greg Laurie, Eric Mason, Matt Chandler and Mark Driscoll labored to draw out the need for men to Act Like Men in today’s effeminate culture. They sought support in their efforts from Lecrae (yes, of rap fame) and the Vertical Church Band. I attended the Friday evening session and the Saturday morning session, and then rushed off to attend a family wedding for the afternoon. I suspect that there are very few men who feel they’re fully the sort of men God wants them to be. So a conference that would push us to greater excellence in the matter has distinct attraction. Still, why attend this conference for such encouragement? One easy reason is that this conference was in my backyard. More, I was familiar with some of the names listed on the program, and here was my chance to hear them live – and so see for myself how they went about the art of public speaking. But most importantly, numerous in our churches take opportunities to check out how other Christians worship the Lord or hear His word, and I saw this as an opportunity to investigate for myself and so be better positioned to assist others. The stadium was packed with men –only men– ranging in age from boys to seniors, hailing from all over Southern Ontario and the northern States. Through a skillful mix of music, film, voice and lights, suspense was built up for the grand opening at 7:00 sharp. The Vertical Church Band cranked out the music at a decibel rate that literally hurt the ears and made any other conversation totally impossible. The lyrics were displayed on the screen –Show us Your Glory and How Great Thou Art– and we were encouraged to sing enthusiastically because, after all, we were rehearsing for the Big Event at Christ’s return. And the crowd responded. James MacDonald, senior pastor at Harvest Bible Chapel in Chicago, gave us the background to this conference. In response to the feminization of western society and the resulting wimpishness of so many men, he wanted a conference that would challenge men to “act like men”. The theme of the Conference was borrowed from Paul’s instruction in 1 Corinthians 16:13,14: “Be watchful, stand firm in the faith, act like men, be strong. Let all that you do be done in love.” He suggested that the middle of this text –the words “act like men”– was the hub around which the surrounding phrases turned. Each speaker at this conference would give attention to the four phrases that explained what acting like men ought to look like. Not act like a super-hero (as if we had it all together). After MacDonald’s brief opening address, Greg Laurie from Harvest Christian Fellowship in Riverside, CA, took us through the opening words of 1 Corinthians 16:13: “Be watchful.” He warned us against falling asleep at the job of being men, warned us of the devil’s unending temptations, and of the need to be ready for Christ’s return at some unknown hour. We were given a lengthy list of dos and don’ts. He ended his address with a brief exposition of why Jesus Christ died on the cross, and then invited men to come forward to commit (or recommit) their lives to Jesus Christ. With the use of prayer, music and coaxing, he collected some 300 men in front of the stage (to the raucous applause of those who remained seated). These men were committed to the Lord, encouraged to stay with their commitment, and given the gift of a “beginner’s Bible”, a New Testament. For the first time in my life I experienced an old-style revival meeting. I came away deeply disappointed at the distinctly Arminian and Methodist strains evident in what was said and how things were done. By 9 o’clock the stadium was packed fuller than it was the evening before. The Vertical Church Band led us again in painful singing – yes, the lyrics were fine so far as they went, but the din left no peace. The music and singing and jumping of the band was described as “worship” (as if “worship” is limited to the stage; that’s a much narrower definition than the Bible uses) and was prompted by the conviction (as explained by the accompanying brochure) that “nothing brings God’s glory down in church as quickly and powerfully as when His people unashamedly adore His great Son.” Hmmm. Really? Does my enthusiastic singing about Jesus Christ and my jumping-up-and-down and my cranking on the music bring “God’s glory” down to us? I didn’t know…. Justification: the fact that God graciously declares guilty sinners to be innocent in His sight because of Jesus’ sacrifice on the cross. He explained that we want to be strong before God in ourselves. But God knows we’re not, and so has given His Son for our sins. God, then, is never surprised at our sins, and we shouldn’t be either. Adoption: those whom God declares as not guilty of their sins He also adopts as His children through Jesus Christ. This is a doctrine we commonly struggle with because we prefer to think that God will like some future version of myself better than my current version – and so we determine to improve our act in order to make ourselves acceptable to God. The hitch is that (and we know it) we never get as good as we think God wants us to be, and so we continue to feel inadequate to be adopted as God’s sons. The truth of the matter, however, is that God adopts us as we are, because Christ has taken the record of our debt with Him to the cross (cf Colossians 2:14). Gracious and almighty God now treats us, broken sinners, as the Father of the Prodigal Son treated his messed up son. Nothing, we were assured, drives away shame like knowing that God has adopted us. Sanctification: the God who adopted us in Jesus Christ knows that we are not yet perfect – and so we need to be content with the fact that imperfection endures. We remain a work in progress, with God daily chiseling away at us through the painful school of life to recreate us more and more after the image of Christ. As we undergo that sanctifying process, every command of God is relevant for our lives. We’re told to love our wives as Christ loved the church. We subconsciously say: given what she is like, God’s command obviously doesn’t apply to me. Wrong, Chandler insisted. God knew ahead of time what your wife was like, and through her God is chiseling away at you for further growth in Him. So obey, and love as Christ loved the church, in total denial of self. “Stand firm in the faith,” then, where you now are, without waiting for a better version of yourself to arise. Now is the moment, and now is the context in which to do what’s right. Be the source of stability and the example in your (broken) family and church. Truly, this was excellent material, Biblically faithful to its core. I was very thankful for this well-presented material, and much edified by it. Next up was Mark Driscoll, from Mars Hill Church in Seattle, WA. His assignment was to unpack the phrase “be strong” in Paul’s instruction to “act like men”. He did so with reference to Genesis 11:10ff, that passage of Scripture that lists the genealogy of Abram. His ancestors, we were told, were ungodly men, and Abram himself in his younger years also did not know God. Abram, then, received no legacy of significance from his father – and so his father Terah was ultimately not a father to be proud of. God, though, graciously adopted Abram for Himself, and so Abram received a new Father, one to be proud of. That gave him a legacy to pass on to his children, a legacy Isaac could be proud of. So many men today have no father to be proud of, but faith in Jesus Christ gives us a delightful heritage to pass on. As a prop Driscoll carried with him a heavy-duty chain (yes, he’s a man’s man…). Holding up the first link in the chain wrapped around his arm, he told us that he was the first known Christian father in the Driscoll family tree, and he looked forward, under God’s blessing, to many generational links in his family after him. Emphatically he told his audience that there were undoubtedly some present who did not believe in the gospel of Jesus Christ and so did not have God as their Father. With reference to John 8:44, he insisted that these unbelievers in fact had the devil as their father. Talk about plain talk! “My job,” he stressed, “is to tell you the truth, and your job is to make a decision.” So true – and he sure said it straight! He wondered how many in the audience of some 7000 were the first link in the chain (in other words, raised by unbelieving parents), and a surprising one quarter (my estimate) of the attendees rose to their feet. Driscoll had encouraging words for these men, as he sought to embolden them to “be strong” in the contexts of their families. He also invited those who saw themselves as weak links in the generational chain (ie, those who call themselves Christians but don’t bother with Bible study, don’t bother to serve wife and children, think first of own needs and preferences), to stand up. Slowly, and with embarrassment, a couple hundred men around the stadium stood up. A touching moment…. These men were encouraged to repent of their sins, put their childish ways behind them, and Act Like Men. Finally, all who wanted to improve themselves in their role as men in their families were invited to stand, and every man in the stadium stood. These men were reassured of God’s grace, and instructed to “be strong” in the Lord. Again, here was a speech I found Biblically very solid, and very encouraging to my task in my family and beyond. As I said, I left for a family function, and so missed the afternoon presentation. I learned from others in attendance that Lecrae did his thing for an hour, to the great appreciation of many. James MacDonald unpacked 1 Corinthians 16:14, “Let all that you do be done in love,” and therein set before men Jesus’ own example in emptying Himself for the sake of His bride. Eric Mason from Epiphany Fellowship in Philadelphia wrapped it all up with a closing presentation replete with a very contemporary and colloquial presentation of God and His grace in Jesus Christ. Because I did not hear the afternoon material, I cannot give any further comment. 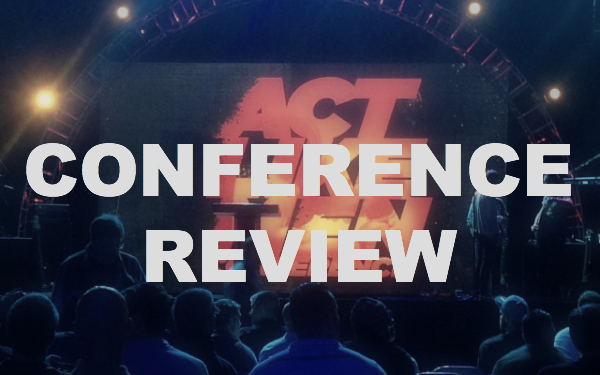 Was attending the first two-thirds of the conference worth it? I did not know what to expect when I signed up for the event. In hindsight I think it was time well spent, especially the speeches of Saturday morning. Here was Biblical material with which I could work in my own life. I also saw something of how others delivered a message and engaged an audience, and that in itself was for me a source of instruction. Can I list negatives? Yes, definitely. The Vertical Church Band did not convey a sense of the holiness of God as presented in the vision Isaiah saw of the exalted God on His throne (Isaiah 6). Was God’s glory ‘brought down’ through the effort to ‘adore His great Son unashamedly’? It seemed to me that the standard for what was acceptable praise to God came from our culture instead of from God’s revealed standards. This comment, please note, does not question the band’s motives; those men are strangers to me and so I’m in no position to evaluate that. This failure to take God’s holiness seriously came out also in some of the presentations – but here I need to be cautious because I did not hear the Saturday afternoon speeches. Did I hear false teaching? I did not appreciate, for reasons mentioned above, the Friday evening speech. Saturday morning’s speeches, on the other hand, were very good. I took the opportunity after the fact to sit down with some congregation members and family to evaluate what we’d heard and seen. I’ll grant that what I wrote above reflects the fruit of that discussion. Ruminating on the event with some others was in itself perhaps the best part of the whole experience. It prompted more careful analysis and reflection, and that is always worth it. And now the proof of the pudding: to act like the men God wants us to be…. To be a strong link in the generational chain is so vital for the spiritual wellbeing of the children that come after me – into unknown numbers of generations…. Next What are you doing?